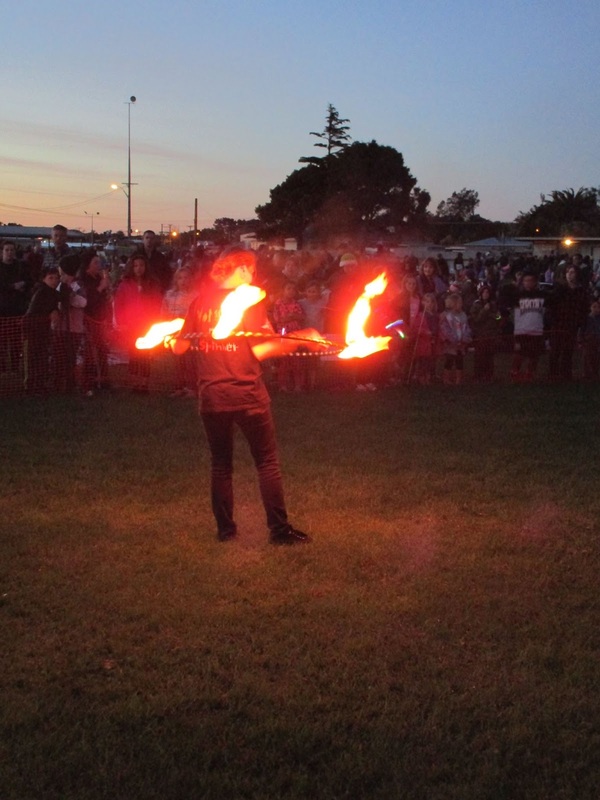 Massey University Fire & Circus: Summer Time Fun! October and November were quite busy for us. Our members were busy with exams (and life), yet still found the time to razzle dazzle at gigs. Now that we are expanding into the ways of "fir-cus" (fire and circus), an interesting range of talents and toys are emerging. Here are some of the gigs we have done over the past couple of months. On the 8 and 9th of October, we performed at the entrance of the Burlesque Festival, greeting guests as they arrived at the Globe Theatre. And what better way to greet people, than by getting out the big firey axe?? Looking festive at the festival. This photo was taken of the gang at the Wanganui Festival of Cultures on the 17th October. 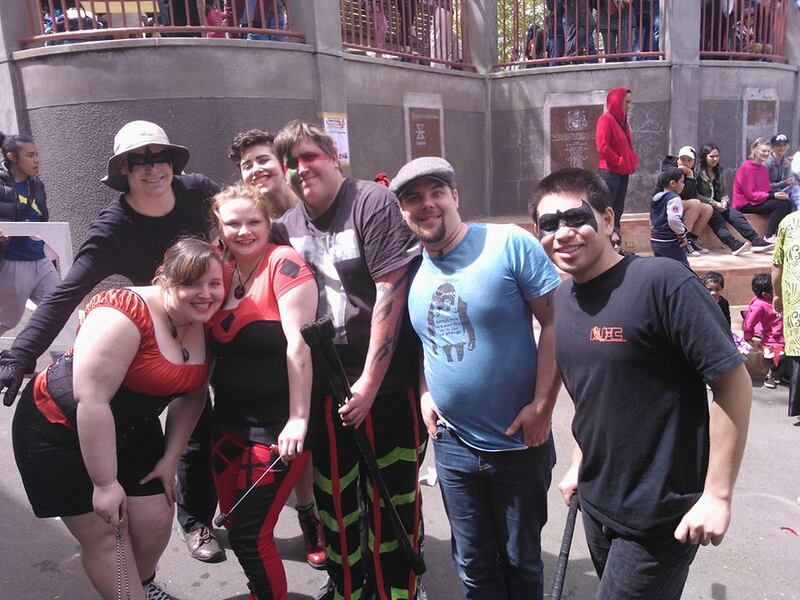 Never before have the Joker and Harley Quinn hung out together like this! We were also invited to be apart of the Wave Rave at the Lido Aquatic Centre on the 30th October. It is a unique gig, as we are using and performing with fire INDOORS, as well as it being along the edge of a swimming pool full of children. Twas certainly an interesting setting! On Halloween, we were invited to perform at the St. Albans Come As You Are Mardi Gra, which was a non-costume family-friendly gig before their fireworks display. 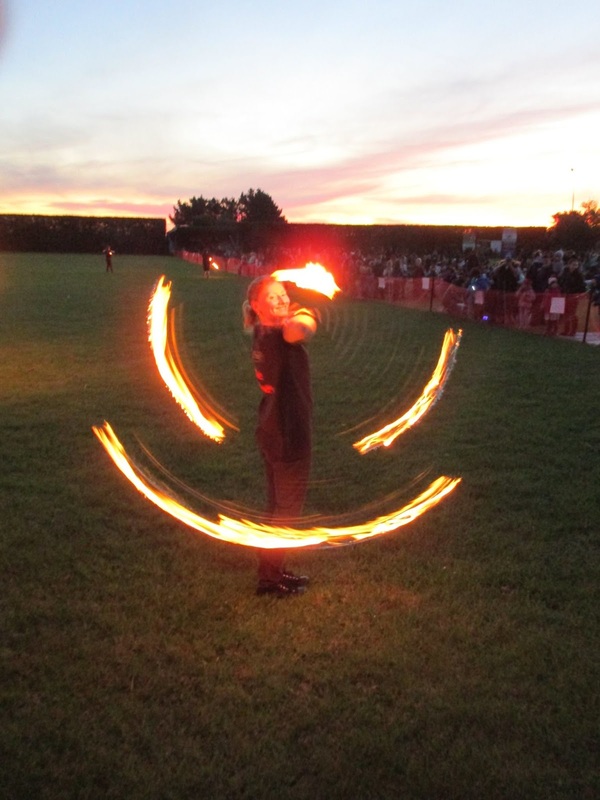 Rongotea have an AMAZING annual fireworks display on the 6th November, which we spin at before the fireworks start. The Rongotea Fireworks gig is one of our busiest performances, and we have the space of an entire paddock to perform in for the very large audience. The next day we were performing again at the very popular Cuba Carnival. It was a bit of a challenge with wind, but the event went down without a hitch. Crosshill Gardens: we were invited to do a non-fire performance at the beautiful Crosshill Gardens in Kimbolton on the 8th of November. 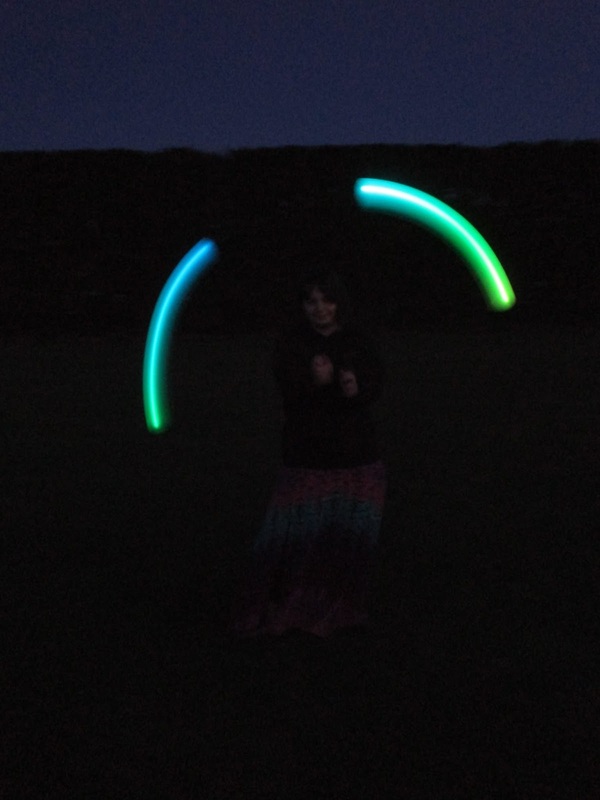 We performed with a wide range of toys, including staff, glow poi, levistick and contact balls. A couple of the very talented ladies even did an Adagio performance, which was extra impressive considering how slippery the ground was! Legend has it that this mystical creature only appears once in a blue moon, but our "highly-experienced" camera crew snapped the creature in its natural habitat before it scuttled away. Marton Market Day. The weather was a bit miserable, but there are no sad faces here! 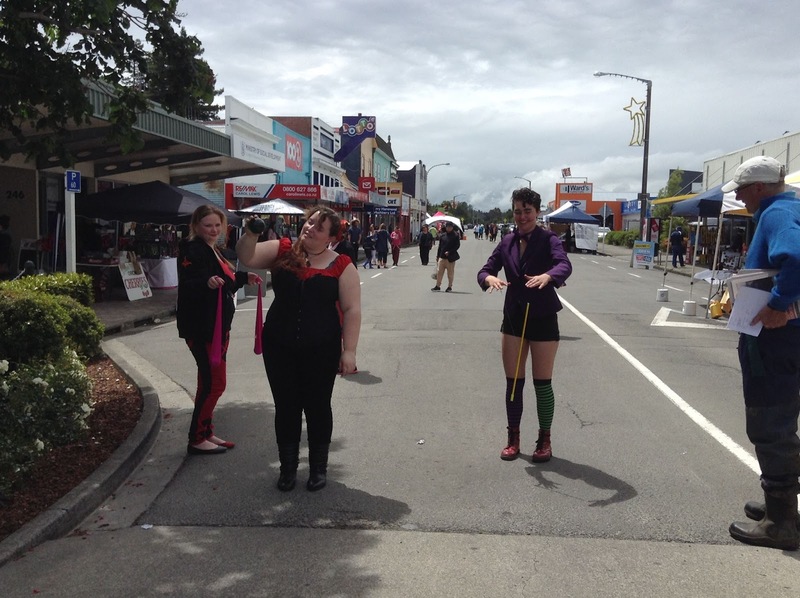 Our members took to the streets of Marton, bringing smiles and laughter to children and adults alike. 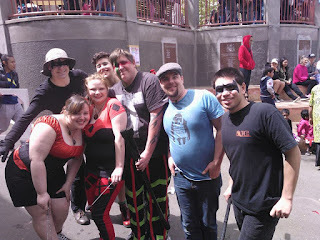 Once again the terrible twosome that is Joker and Harley Quinn were set loose! We have certainly been busy lately and with so much more fun to come over the holidays. So stay tuned for more fire-burning, staff-twirling, poi-spinning fun.